BitLocker is a full drive encryption. It was first introduced in Windows Vista and is aimed to protect your data even if someone has physical access to your PC or laptop. 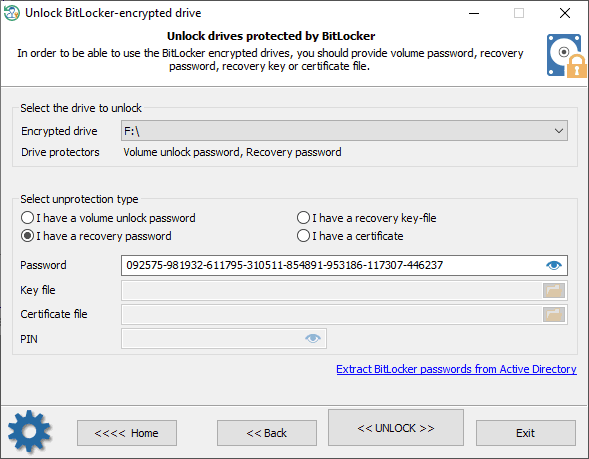 Just select your BitLocker-encrypted drive along with required unlock type and click << UNLOCK >> button to decrypt it. The operation takes several seconds. To extract BitLocker recovery passwords from Active Directory, you can use our Windows Password Recovery tool.